Ok #mtgfinance, can someone write an article comparing Thoughtseize with another Modern staple that rotated out of Std? S.oze? Abrupt Decay? @Robobear82‘s request couldn’t have come at a better time with Theros block staples having just seven more months of Standard play. @Robobear82 called for a Batman #mtgfinance writer and he shall get one. Today we will be discussing a Magic finance fundamental: the price trajectory of Standard-legal Modern staples and when to pick them up. Historically, the price of Standard staples from the previous block began their downward spiral around this time of the year, all the way through summer until the end of their lifespan in Standard (Although this year may be slightly different due to the new preliminary Pro Tour Qualifier system, but that’s not what we would be discussing today). The conventional wisdom would be to pick up Standard staples for casual use or investment around rotation in September. However, as all know that Modern staples are the exception. Argh, my hand! What are you doing to my hand! Thoughtseize was one of the most iconic discard spell ever printed in the history of Magic. Ravaging hands since 2007, Thoughtseize saw play in every single format it was legal in, including the hallowed halls of Vintage, and Commander (Duel Commander counts as Commander right). Thoughtseize’s cross-format ubiquity and popularity in Modern (mtgtop8 ranked Thoughtseize as the 23rd most played card in Modern in 2014 – just two places behind Tarmogoyf – being present in 17.5% of Modern decks in an average of 3 copies) made it one of the most sought after Theros card. As of writing, the Theros version of Thoughtseize stands at $19 while the Lorwyn copy hovers around $35, half of its previous high of $70. I am not sure if Thoughtseize would ever hit $70 again, but one thing for sure, that card is not going to remain at $19 a year or two down the road. To answer our question on when is the best time to get in on Thoughtseize, let’s dig through time to have a look at how the window to pick up Modern staples evolved through the years. The figures used in this article comes from mtgtop8.com’s format top cards list. The list describes the ubiquity of cards in each format and ranks cards by the percentage of decks in which a card was found in. Modern was announced in fall of 2011. The price of Zendikar fetchlands – which were played in every single format they were legal in – barely budged when Zendikar rotated out during the fall of 2011, unlike the rest of the standard staples from the same block. The blue fetches actually experienced a slight bump upon rotation. The Zendikar fetches were a precursor to a new trend where the price of Standard staples that saw play in Modern, then still a fledgling format with an uncertain future (kind of like Tiny Leaders now. Shameless subliminal message plug) would not tank upon rotation. One does not simply cast Lighting Bolt just four times. Snapcaster Mage was a Standard powerhouse, and although he was not as pervasive in Modern as he is today, Tiago Chan’s invitational card was already considered a Modern staple when Innistrad rotated in the fall of 2013 (in 2014, Snapcaster was the most played creature in Modern, and fifth most played card with a presence in 30.8% of Modern decks, compared with 2013 when he was the second most played creature, and eleventh most played card with a mere 25.1% saturation across Modern decks). 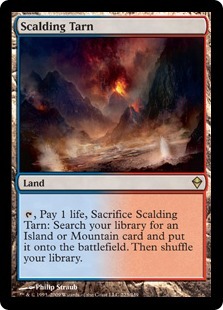 We expected no less from a card that was initially designed to be a land that could counter spells! 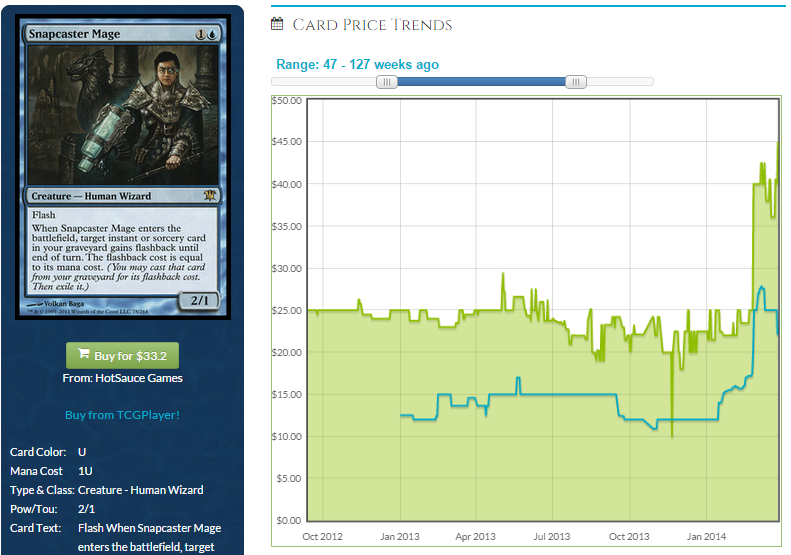 Snapcaster trended down during the months preceding Innistrad’s rotation in September 2013 and touched $20 briefly in mid-August 2013. He hovered around $20 – $23 for five months after rotation. 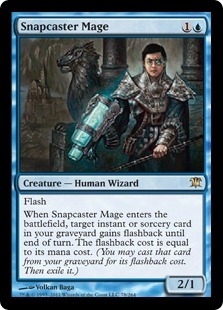 At the end of February 2014, Snapcaster Mage shot up to $40. 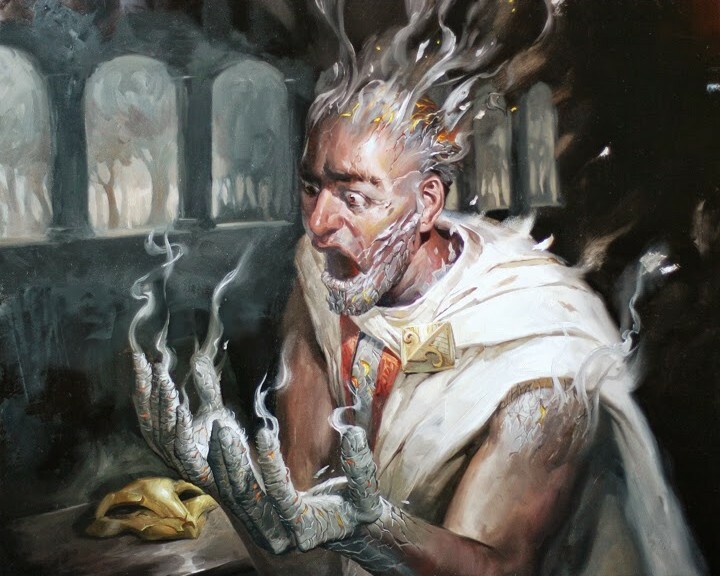 Patrick Dickmann’s Tempo Twin archetype which ran a playset of Snapcasters alongside the Splinter Twin plan was the breakout deck at Pro Tour Born of the Gods, putting the Tempo Twin archetype on the list of tier one Modern decks (though the deck debut in November 2013). 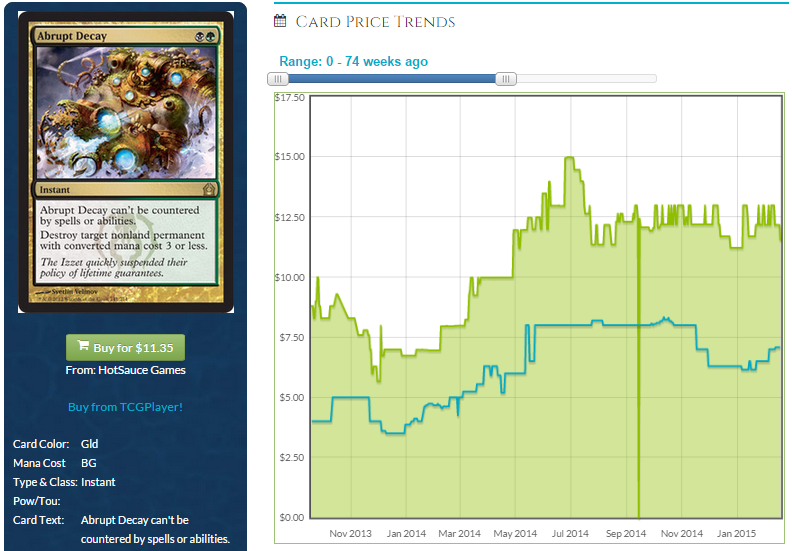 Snapcaster went down to $35 for the better part of 2014, but as of writing, seemed to be hitting a new ceiling of $45. Again in no small part due to Antonio Del Moral León taking down Pro Tour Fate Reforged with a Splinter Twin deck running three copies of Snapcasters in the main. The window to pick up Snapcaster Mage would have been the seven month trough between July 2013 and February 2014, when he was fluctuating between $20 to $23. All rare cards are rare, but some rare cards are rarer than others. Being two years older, Innistrad’s print run was not as high as Theros’ and as a result Snapcaster Mage has a relatively higher rarity than Thoughtseize in terms of supply rarity (last week’s Brainstorm Brewery’s Finance 101 segment dealt with this topic). Abrupt Decay was printed just one year apart from Thoughtseize. and as far as I can recall, Return to Ravnica set a new precedent by being the first of the annual bestselling ever set, a testimony to either the burgeoning Magic playerbase or the fact that shocks sell. The existence of your threat was… abrupt. Abrupt Decay enjoyed similar levels of multi-format permeation as with Thoughtseize and Snapcaster Mage, being casted in all formats it is legal in. 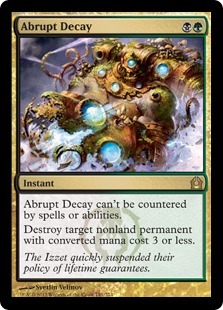 After all, Abrupt Decay is the ultimate removal for any nonland permanents it could target. In 2014, Abrupt Decay was present in 22.1% of Vintage decks, being played in Fish variants (sometimes up to a full four copies in the mainboard), Sultai tempo decks and Control. It was found in 18.9% of Legacy decks and was the 17th most played Modern card in 2014, with 20.7% of decks running it. Hey, its even a staple in the newest format on the block, Tiny Leaders. Abrupt Decay bottomed out in November 2013. Its price started ascending at the beginning of February 2014, hitting $10 in the middle of March before peaking at $15 in July and has been hovering around $12 since. The demand from Abrupt Decay was most likely from non-rotating formats; it barely saw play in the trifecta Mono Black vs UW Control vs Mono Blue Return to Ravniva – Theros Standard. Abrupt Decay was the 67th most played card in Standard, with a saturation of just 7.9% of the field. The window to pick up Abrupt Decay shut a whole six months earlier than Snapcaster Mage. The best time to up Abrupt Decay was the two month trough between December 2013 and February 2014. Abrupt Decay could be picked up on the cheap nine to seven months before rotation, compared to Snapcaster Mage, who could still be found on the cheap two months before rotation and up to five months post-rotation. While Steam Vents did not enjoyed the amount of play Snapcaster Mage and Abrupt Decay saw, Steam Vents was the third most played card in Modern in 2014, being tapped by a whooping 36.1% of decks. 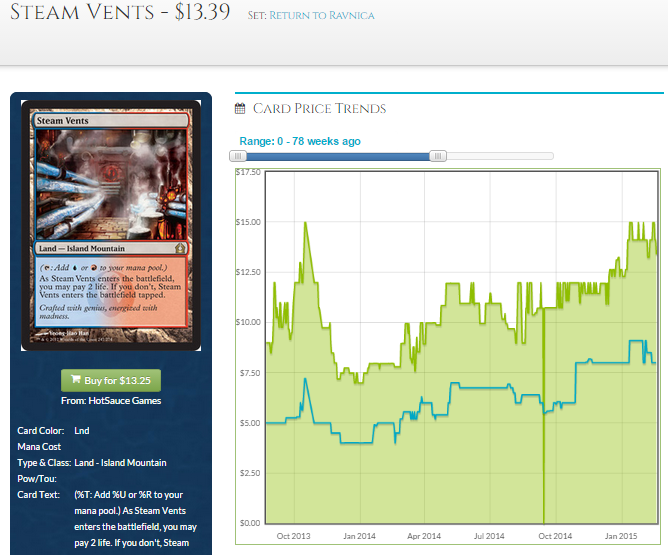 Like Abrupt Decay, the best time to pick up your Steam Vents would have been between December 2013 and February 2014 when it was $7.50. There was a slight dip in the month before rotation, but Steam Vents never went below $9. As we have seen in the price history of the few Modern cards above, the window, the window to get your hands on Standard-legal Modern staples is no longer a few months prior rotation. 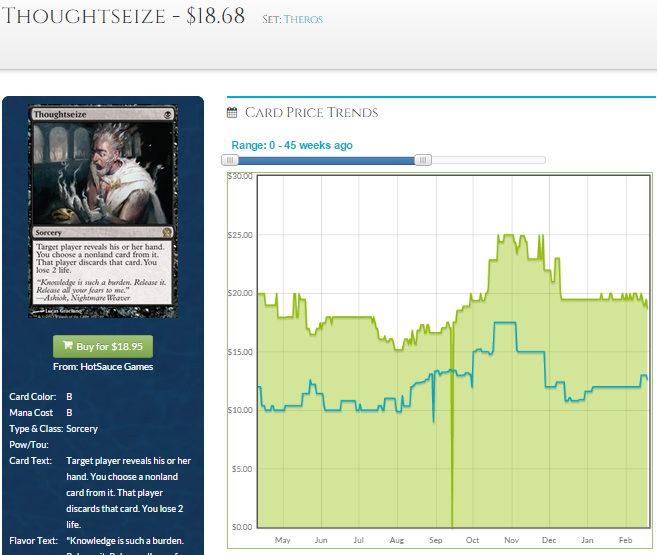 Thoughtseize was at its bottom from July to September last year, fluctuating between $15 to $17. 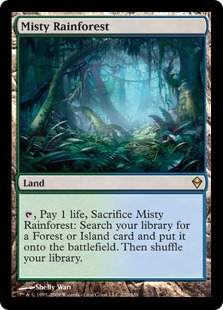 It went up after Ari Lax took down Pro Tour Khans of Tarkir with Abzan Midrange with four mainboard Thoughtseize and spent a couple of months above $20, but is now back at $19. Based on the price history of Modern staples from the previous block, the window to stock up on your Thoughtseizes is probably right now. There is one caveat: the upcoming Dragons of Tarkir Event Deck could potentially contain Thoughtseize, the way the Fate Reforge’s Clash pack contained a copy of Hero’s Downfall, leading to a dip in the price of Hero’s Downfall right after the decklists were spoiled. If you want to be safe, you could wait until the decklist for Dragons of Tarkir’s Event Deck comes out, which should be in a few weeks time. However, getting in on an all-format all-star card at $19 seems pretty good. Thoughtseize could easily be a $40 card in the near future, and I think it’s worth the risk of losing a few bucks to an Event Deck reprint. If you have any questions or comments, you can find me on Twitter @theguoheng or just drop a comment below. I did not include Mutavault as I wanted the comparison to be just between fall set rares. This is interesting because I’ve been eyeing fetches and they seem like they’ve bottomed out. With the new block and draft structure with dtk, I don’t see them following a thoughtseize like trend but rather being at their lowest point now. The new block structure will definitely shift the pattern but I don’t think it would affect the KTK fetches yet. I am not sure if the KTK fetches are at their absolute bottom right now, but I think we are pretty damn close to it. 1) Modern Masters could have been a factor for RTR shocks to bottom out. Could KTK fetches follow suit with Modern Masters 2015 this summer? 2) Summer has historically been the low point for Standard prices. A counter argument would be the new PPTQ structure creating more summer demand for Standard cards.